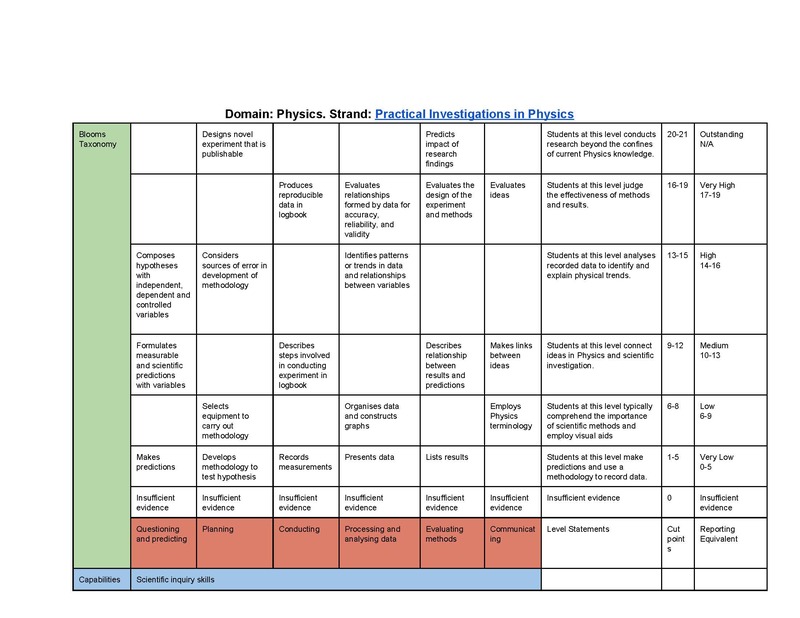 In VCE Physics, students are required to undertake regular scientific practical investigations, included for the purpose of assessing outcomes of the VCE Physics course. Students perform experiments using scientific apparatus after formulating a hypothesis and developing a methodology. Students are able to perform experiments in pairs but are required to keep records of the experiment and report on their findings individually. Purpose What was the purpose of this assessment? Administer How was the assessment administered (conditions, time, individual/group, access to resources, assistance to students, etc.)? Record What records were kept from assessment (mark in markbook, added to student portfolio, etc.)? Student practical logbook and A2 Poster submission, marks kept on school intranet visible to students, teachers and parents. Interpret How was this assessment evidence interpreted for each student (mark, grade, list of skills to teach next, curriculum level, etc.)? Mark and written feedback informing them what they have done well and what they need to do in future. Use How has the assessment and its interpretation been used (reporting, feedback to students to inform future teaching, etc.)? Contributes to School Assessed Coursework ranking that will ultimately contribute to their study score in VCE Physics (SACs make up 40% of their study score). Informs use of targeted teaching plan.